Alfalfa weevils develop based on temperature or accumulating degree days. This cool spring has delayed all insect development, including alfalfa weevil. 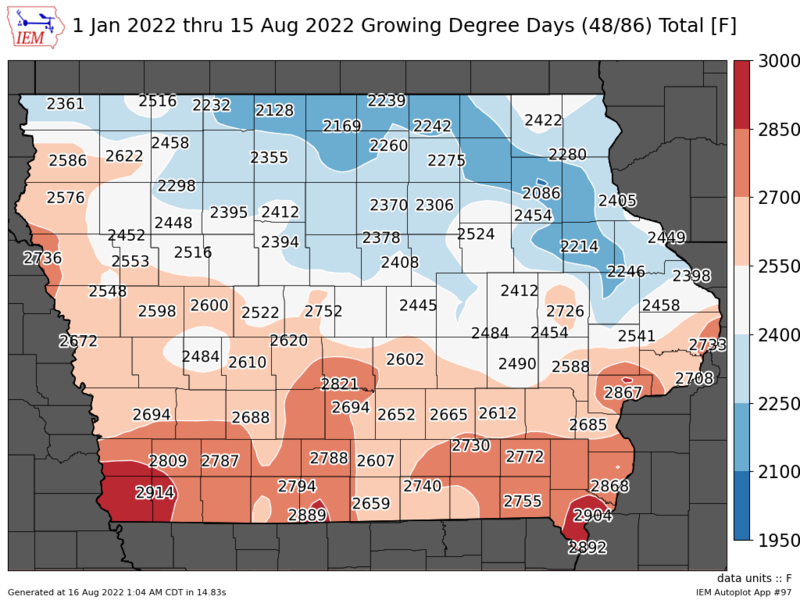 Scouting in alfalfa should begin at approximately 200 degree days for areas south of Interstate 80, and 250 degree days north of Interstate 80. Based on accumulated temperatures since January, weevils are active in southern Iowa now (Fig. 1). Figure 1. Accumulated growing degree days (base 48°F) in Iowa from January 1 through April 30, 2013. Map is updated daily at http://mesonet.agron.iastate.edu/data/summary/gdd48_jan1.png. Map courtesy of Iowa Environmental Mesonet, ISU Department of Agronomy. Alfalfa weevil is an important defoliating pest in alfalfa. Heavy infestations can reduce tonnage and forage quality. Adults can feed on plants, but the larvae typically cause the majority of damage. Newly hatched larvae can be found feeding on terminal leaves, leaving newly expanded leaves skeletonized. Gradually maturing larvae (Fig. 2) move down the plant and begin feeding between leaf veins. Adults (Fig. 3) eat along the leaf margin, leaving irregular notches. A heavily infested field will look frosted or silver (Fig. 4). Figure 2. Alfalfa weevil larvae have a dark head and pale green body with a white stripe down the back. Fully grown larvae are about 5/16 inches long. Photo by Clemson Cooperative Extension Slide Series, www.ipmimages.org. Figure 3. Alfalfa weevil adults have an elongated snout and elbowed antennae. Their wings and body are mottled or brown in color. Photo by Clemson University, www.ipmimages.org. Figure 4. Heavily defoliated alfalfa fields appear frosted from a distance. Photo by Whitney Cranshaw, Colorado State University, www.ipmimages.org. To initially detect alfalfa weevil larvae in the spring, use a sweep net to sample. After finding larvae, collect six alfalfa stems from five locations throughout the field. Take each stem and shake into a bucket to dislodge larvae from the plant. Average the number of larvae per stem and plant height to determine if a foliar insecticide is warranted (Table 1). Remember, cutting alfalfa is an effective management tool for alfalfa weevil larvae, and an insecticide application may be avoided if harvesting within a few days. Table 1. Economic threshold of alfalfa weevil, based on the average number of larvae in a 30-stem sample. Erin Hodgson is an assistant professor of entomology with extension and research responsibilities; contact at ewh@iastate.edu or phone 515-294-2847. Adam Sisson is an Integrated Pest Management program assistant. Sisson can be contacted by email at ajsisson@iastate.edu or by calling 515-294-5899. Links to this article are strongly encouraged, and this article may be republished without further permission if published as written and if credit is given to the author, Integrated Crop Management News, and Iowa State University Extension and Outreach. If this article is to be used in any other manner, permission from the author is required. This article was originally published on May 2, 2013. The information contained within may not be the most current and accurate depending on when it is accessed.